RID is eager to inform the public, media, and healthcare professionals about new, innovative products and services designed to reduce hospital infections. The following companies have contacted RID and requested to list their new products. RID has not tested these products and therefore cannot endorse them. But RID encourages all website users to read about them and use the links provided here to contact the companies and acquire more information. Click here to download RID’s quarterly newsletter. NOZIN Nasal Sanitizer is an over-the-counter product with demonstrated microbial killing activity that is typically applied to the skin at the opening of each nostril. This vulnerable area of the nose is where germs colonize and are deposited by airborne droplets or soiled fingers. The patented formula combines the proven, safe antiseptic power of alcohol with the moisturizing, antioxidant benefits of natural oils. In testing by independent FDA registered laboratories, NOZIN Nasal Sanitizer was shown in vitro to kill 99.99% of a broad spectrum of pathogenic organisms. Human testing demonstrated that the microbicidal activity persisted in the nose for at least 8 hours from the time of application. The company has conducted research funded by the NIH in collaboration with researchers at the Johns Hopkins Bloomberg School of Public Health. Global Life Technologies Corp. is interested in partnering with hospitals to investigate the impact of NOZIN on reducing SA/MRSA colonization. 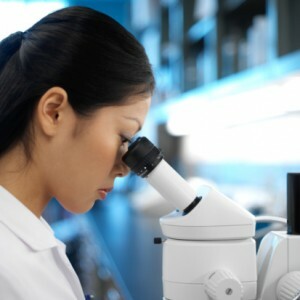 For more information, visit www.nozin.com or contact John A. Willimann, president and chief science officer. The entire front surface and keys are solid, EPA- approved CuVerro copper. We at RID found this product interesting because computer input devices are among the most heavily contaminated surfaces in intensive care units. There are many washable, even immersible keyboards, but this is the first inherently anti-microbial keyboard we are aware of at this time. As the push for electronic medical records continues, it is urgent that we develop ways to prevent keyboards from being vectors of disease. Copper is inherently anti-microbial, meaning it will kill bacteria and viruses that settle on its surface quickly and completely. This should help solve the problem of caregivers who enter information in the bedside computer, then go back to the patient without cleaning hands first. The copper will continuously destroy pathogens on the surface of the keyboard. For more information, contact Bob Nolan of Operator Interface Technology at www.oitkeypad.com or Bryony Samuel of the Copper Development Association at www.antimicrobalcopper.org. AGIENIC INC. is a Tucson, Arizona, based nanotechnology start-up with a patent-pending technology that in the future may be used to produce bulk polymers, ointments, implantable medical devices, and many other products that constantly destroy bacteria, viruses, molds and fungi, and even spores. The technology can be used to produce coatings that will maintain their antimicrobial efficacy for months or longer, and at low cost. The technology can also be used to produce bulk polymers used in manufacturing keyboards and other items. This might someday give copper keyboards a head-to-head competition. The same technology, according to the research team at Agienic, will be usable to manufacture implantable medical devices, lotions and ointments. For more information, visit www.agienic.com. 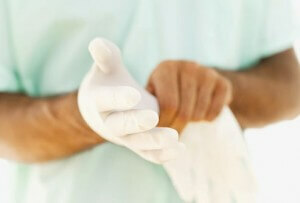 Too often caregivers pull gloves out of a box without cleaning their hands first. The obvious result is that their unclean hands contaminate the outside of the gloves. Gloves are no substitute for correct hand hygiene. But Liferose Products has developed a glove delivery system that enables caregivers to don gloves without touching the outside of the gloves. This technology is promising because it avoids having to change human behavior, one of the hardest things to do. This is an early-stage product for which a patent has been applied. For more information, contact Liferose Products Chairman and CEO John C. Howard at john.howard@liferoseproducts.com. Caltech Industries Inc. specializes in products and services that protect healthcare workers from contamination by dangerous pathogens. Caltech products are available nationwide through medical, dental and laboratory suppliers. Corporate personnel can assist you with questions or with locating a distributor or sales representative in your area. Contact the corporate office by telephone at 800-234-7700 or visit our Contact Us page. Finally there’s some good news in the fight against certain life-threatening bacteria* that cause hospital-acquired infections. As a supplement to standard cleaning and disinfection practices, uncoated copper, brass and bronze have been proven by EPA-approved testing to be 99.9% effective in killing deadly bacteria*, including MRSA, within two hours. This makes these inherently antimicrobial materials perfect for common touch surfaces such as door handles, IV poles, hand and bed rails, service carts, trays, countertops, keyboards, bathroom fixtures—and hundreds of other surfaces that might become contaminated with bacteria* that can cause infections. Find out more about how copper and copper alloys kill deadly bacteria* where they lie by visiting antimicrobialcopperalloys.org. *Testing demonstrates effective antibacterial activity against Staphylococcus aureus, Enterobacter aerogenes, Escherichia coli O157:H7, Pseudomonas aeruginosa, Methicillin-resistant Staphylococcus aureus (MRSA). DIATHERIX Laboratories Inc. (DLI) is an emerging leader in infectious disease diagnostics and drug resistance detection services. Using a multiplexing platform, DLI has developed a series of molecular differential diagnostic services that enable unprecedented speed and accuracy for health care providers in the identification of disease-producing pathogens, leading to appropriate treatment for patients. DLI is a CLIA certified laboratory that is also involved with clinical trials for future products and pharmaceutical development. DLI provides clinical laboratory services on a multiplexing platform for the detection of infectious diseases. The testing is based upon molecular differential diagnostics (MDD) for the identification of DNA/RNA for bacteria and viruses. The primary area of focus in infectious disease includes pathogens associated with respiratory infections, Staphylococcus differentiation including MRSA and healthcare associated infections (HAI). For more information, visit www.diatherix.com. DiFusion Technologies is an orthopedics company in Austin, TX, focused on the development of CleanFUZE™ antimicrobial technology for use in orthopedic implants. DiFusion has identified several groundbreaking applications for this technology and has laid the framework for its successful commercialization. In fact, preclinical testing showed that CleanFUZE™ can eliminate 99.9999% of active bacterial colonies, including Methicillin Resistant Staphylococcus Aureus as well as other virulent bacterial strains often implicated in surgical site infections. CleanFUZE™ has the potential to deliver benefits across the healthcare spectrum. For patients, it may reduce the risks of additional surgeries and IV or even lifetime suppressive antibiotics. For physicians, CleanFUZE™ utilizes current surgical techniques, well accepted implant designs and current reimbursement codes. Finally, for hospitals and payers, CleanFUZE™ offers potential savings on complications and unreimbursed costs attributable to SSI’s. For information, visit www.difusiontech.com. CleanFUZE™ is under development and not approved for human use by the U.S. FDA. Digz 4 Dignity manufacturers’ patient and professional apparel. Our garments offer a superior combination of ample coverage, medical access, innovative designs, and high quality comfortable fabrics. Using patented silver ion technology, Digz 4 Dignity is able to deliver apparel treated with the leading antimicrobial at a competitive price. The innovative silver technology has been proven to inhibit the growth of bacteria, viruses, microbes, mold and fungi adding a protective barrier to the fabric. The 65/35% poly/cotton blend has a soft, light feel and provides greater ease of movement. Digz 4 Dignity apparel is available with and without antimicrobial treatment. Key benefits include: restored dignity; antimicrobial agent; infection control through hygienic coverage and removal without disturbing IV lines; cleanliness; light weight, breathable fabric saves thousands on laundering costs, weighs up to 1/3 less than competition; reinforced stitching; outstanding certified wash test results; sizes from pediatric to bariatric; custom manufacturing; logos. For more information, visit www.digz4dignity.com. the LifeSync® ECG System can help reduce the risk of hospital acquired infections by eliminating one of the last reusable items prevalent in critical care: ECG lead wires. In a study conducted at theUniversity of Wisconsin, 77% of reusable ECG lead wires were found to be contaminated with one or more drug-resistant pathogens-AFTER they had been cleaned according to standard hospital guidelines and manufacturer recommendations! The LifeSync® LeadWear® Disposable replaces conventional reusable ECG leads with a single-patient use solution designed to work with existing monitoring devices. In addition, the LeadWear® Disposable can actually improve monitor performance by helping to minimize artifact created by patient movement. For more information, visit our web site at www.lifesynccorp.com or call 866-324-3888. Computer keyboards are everywhere in schools and healthcare facilities. Today, smarter prevention and control of acquired infections are driving the need for an infection-control keyboard: a new generation designed specifically for easy cleaning. Typical school and healthcare keyboards have many users, so cross-contamination from user to user can result in severe consequences—particularly iftransient bacteria such as methicillin-resistant Staphylococcus aureus (MRSA) are present. Strong arguments for improved infection-control methodology are evident where computer keyboards collect bacteria and require attention to maintain cleanliness. For more information, visit www.advanced-input.com/medigenic or call-800-444-5923, ext. 1222. Union Springs Pharmaceuticals, LLC is the creator of MyClyns, the new non-alcohol personal protection spray you can immediately use on your face when exposed to harmful pathogens. MyClyns contains a fast-acting solution with germ-killing action that is safe to use on eyes, nose, mouth and open wounds. Independent laboratory tests show that the solution in MyClyns demonstrates a 99.99% reduction in over 60 potentially dangerous pathogens. Visit www.MyClyns.com for more information. Oculus Innovative Sciences is a biopharmaceutical company focused on developing and commercializing its patented topical Microcyn® Technology platform, with the goal of becoming the standard of care for treatment of wounds and infection-related afflictions while reducing the need for antibiotics. The Microcyn® Technology is a safe-as-saline anti-infective that quickly eradicates a broad range of pathogens, including antibiotic-resistant bacteria (including MRSA and VRE), viruses, fungi and spores. Dual-action in nature, in addition to killing the infection, the Microcyn also accelerates the wound-healing process by reducing inflammation in the wound and increasing nutrient-rich blood and oxygen flow to the wound bed. Twenty-five clinical studies have demonstrated Microcyn Technology to be both safe and effective in killing pathogens. Using a proprietary and non-cytotoxic formulation of oxychlorine compounds in a pH-neutral solution, Microcyn Technology is ideal for treating a broad range of pathogens. Oxychlorine compounds occur naturally in the human body as they are released by neutrophils, which are the most abundant type of white blood cells in humans and form an essential part of the immune system. e hand hygiene. At the core of the system are personal ergonomic, body-worn hand sanitizer dispensers that are designed to become a second-nature habit in use. The point-of-care dispensers are surrounded with the multimodal components called for by the CDC guidelines including electronic tracking, a behavior modification system, online education, compliance management software, a cultural program, and more. For more information, visit www.sprixx.com. Staph Attack® is a colorless, odorless antimicrobial disinfectant and deodorizer that is proven to kill bacteria, fungi and viruses—but with the lowest toxicity rating given to any EPA-registered disinfectant. * This product has been formulated to disinfect hard, non-porous environmental surfaces, and its odorless formulation means no harsh chemical fumes. With its powerful antimicrobial properties, Staph Attack is ideal for use by: Healthcare facilities including hospitals, clinics, physician/dental offices, nursing homes and ambulances; Correctional facilities including law enforcement transport vehicles; Centers for learning, especially in cafeterias, nurses’ offices, classrooms, restrooms and locker rooms; Sports arenas, both in public areas and locker rooms, restrooms and food service areas. For more information, call 904-543-2486 or email staphattack@aol.com.